* to be big enough to carry pretty heavy stuff: my usual count: passport, airplane tickets, health insurance in a nice leather case; big wallet; make up bag with hand lotion, Avene aqua spray, lip gloss (usually from Estee Lauder), Nivea deo spray, some perfume samples, tissues and many other beauty products that i can't remember right now; 2 pairs of sunglasses (mine's and hb's), witch, depending on case, can have rather bulky cases. * to match as many outfits as possible, because if i fly somewhere, i always have to come back, and who knows what i will be wearing that day. This year, and also last year, i choose to go with my pink Escada beach bag (convenient, big and comfy enough), but i wasn't quite happy with the over-all look and the way it matches my airplane outfits. So nine hours to Curacao, and some more back is enough time to think at this important style matter. I began by study every other woman bag on the plane, and suddenly i knew the answer: the Longchamp Le Pliage is the perfect bag for this kind of occasions. Existing in every shape you may want, from the classical handbag to big travel bags, back packs, briefcases, totes, cosmetic bags and suitcases, all in several different sizes also, the Le Pliage bag is quite a practical and essential piece for every traveling woman. When you don't use it, you can fold it in a small coin-wallet size (hence the french name "Pliage"). This year collection goes from tan to natural, delicious tones, like pistachio, chocolate, vanilla or sky blue. 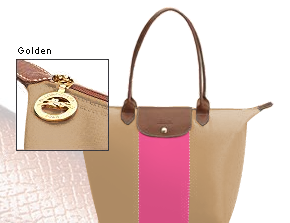 Browsing some more around the Longchamp website (http://www.longchamp.com/en/) i discovered a really nice feature: you can create your very own Le Pliage bag in 4 easy steps, and then order it online through their system. I customized a medium handbag (i think the large one is too bulky), with long handles (so i can wear it on my shoulders), in a delicate beige tone with a bright pink center stripe. I added a golden finish for the metallic accessories and as a personalized detail my name embossed on the bag flap (i feel like a celebrity :) having a personalized bag). You could choose also an embroidery of your name (max 8 characters) on the bag canvas. The total price: 105 euros. 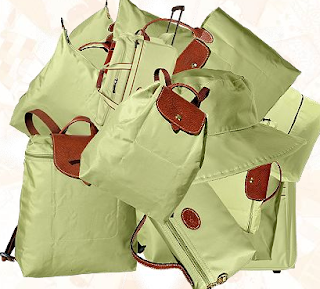 What to you think about Le Pliage LongChamp bags? Are you gonna buy one for yourself? understand how I coped without it! Gym, hand luggage on a plane or weekend away - All covered! hey what is that actual color of pink on the website?